Powdery mildew is a white, powdery looking fungus the grows on leaves. 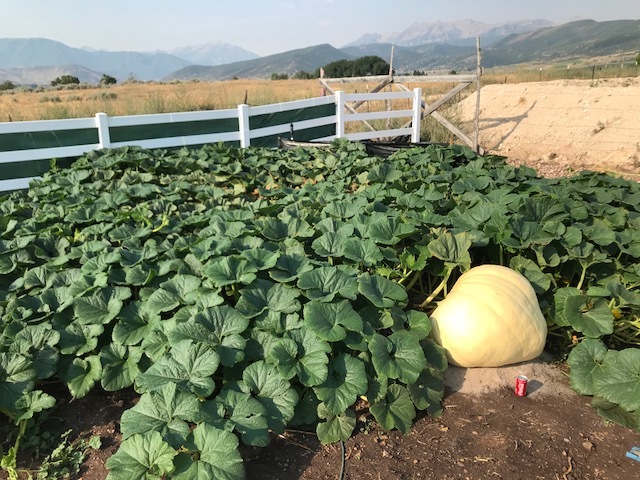 Pumpkin plants seem to be particularly susceptible to it and once you get it, you can't really get rid of it unless you use some very powerful fungicides that I prefer not to use at all. An ounce of prevention is worth a pound of cure in this case. Usually around the first few weeks of August I'll start seeing some signs of powdery mildew. Getting a little isn't a big deal, but if it gets out of control it can take a plant down. Usually that isn't a problem for healthy plants, but powdery mildew will damage leaves and as a result affect pumpkin growth. So what I typically do around this time of year is use Actinovate. It is an organic fungicide that seems to work well if applied a couple of weeks before the powdery mildew starts showing up. It won't knock out powdery mildew once you have it, but from experience I can say that it reduces the amount of powdery mildew and can help slow it down when you do get it. The day before yesterday I started brewing some compost tea and put a touch of Actinovate in the brew at the beginning. I then added some more the last 15 minutes of the brew. That compost tea was then splashed on all of the leaves of the plants. I found that works pretty well. So far this year I've seen no signs of powdery mildew (knock on wood). When powdery mildew does start, another organic way to help contain it is spray some silica on the leaves. It will actually be used by the plant to form a silica barrier around the infected area to help contain the infection. I've been using the fertigation that I mentioned on the 2145 plant, so it gets fertilizers at each watering. Yesterday I gave both plants some compost tea. The day before that I gave the 1794 plant potassium and aminos. I also gave both plants some granular 7-2-1. 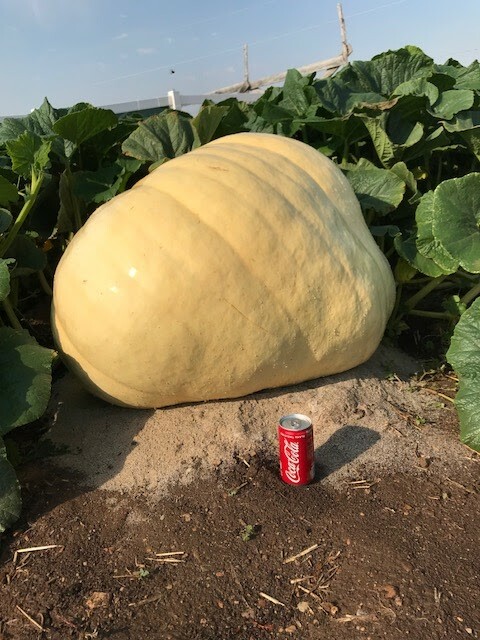 Here are the latest pics from the pumpkin patch. Pumpkin growth is a little ahead of last year. The 1974 (Grandpa Dee) is going to have a little orange to it. The 2145 (Unlce Sam) I think is going to be white. 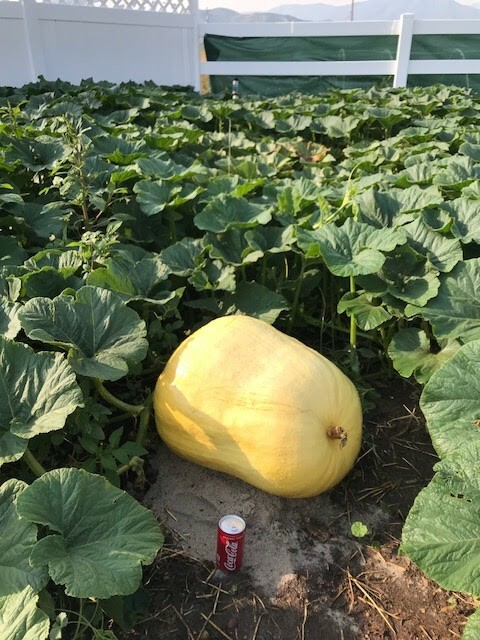 It is six days younger than the 1974 pumpkin, but growing at a similar rate. My son's 1764 is going to be very orange, so we pretty much have all of the shades covered. 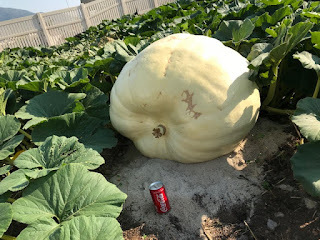 The 1764 I think could end up growing my son's biggest pumpkin ever. Plant is in good shape. Could use a little more care by him, but he is doing a good job (he needs to pull some weeds). That seed was crossed with the same same plant that grow the 1974, but you would never know it. 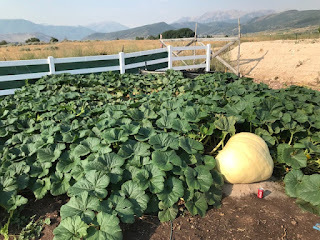 My 1974 and his plant are very different and the pumpkins are complete opposites in terms of shape and color. This week I finally hooked up the fertigation system for the 2145 plant. Basically fertigating is injecting fertilizer directly into the irrigation water to feed the plants. This is the PERFECT way to give nutrients to the plants. As you already may know the NPK RAW fertilizers use are very popular with hydrophonic growers because all of the fertilizers are water soluble. So what happens is the fertilizers are put into a container with water that has a tube going into it. The fertilizer is then pulled up via an injector that mixes the fertilizer solution with the irrigation water and then is sprayer out under the leaves via the Dan micro sprinklers that I have. The end result is spoon feeding that is evening distributed throughout the entire patch with each watering. The injector has a flow valve on it that allows me to control the amount of fertilizer solution that is injected. In the coming weeks I'll do a video showing the setup. In that fertilizer container I have some 3-12-12, Omina and a little extra potassium. Today I sprayed some 3-12-12 with Omina under the canopy on the 1974 plant. That plant unfortunately I don't have a fertigation setup for because is is watered with rotary sprinklers. Yesterday I gave the plants some 3-12-12 with a touch of extra potassium added. Today I gave the plants some 7-4-5 with a touch of extra potassium added along with some b-vitamins. I also sprayed some insecticide on all plants after finding some bugs on the plants yesterday. This morning I did the first over the top measurement on the Grandpa Dee pumpkin (1974 McConkie). Doing an eyeball measurement, I knew that pumpkin wasn't exactly where I want it to be. The tape confirmed. Here is the hope. A couple of weeks ago I looked at pictures of my plants from last year and compared. Both plants this year are in better shape at this point of the season than last season. I think the soil is a little better than last year too. It was interesting looking at how similar my 2145 plant is to the 1685 plant from last year. Growth rate, leaf shape and everything else are about the same. The same is true of the 1974 plant to the 747 plant. Growth rates, leaves, etc are ball park similar. Doing a comparison of pumpkin measurement of the 747 to the 1974 and the 1974 is a bit ahead. I guess in some ways that shouldn't surprise me. I had forgotten, but growth in the first four weeks of last year was also slow. I'm going to guess the 2145 (Uncle Sam) is going to be ahead of the 1685 plant as well at day 28. The 1685 was a very slow grower early. Here is the key. Both the 747 and 1685 plants were slowed up by environmental factors last year. I think the weather has maybe been a touch worse this year, but not by much. What worked out okay for the plants last year is that they never put on a lot of pounds per day, but they grew long. They both kept growing past 100 days and were still growing when they were picked. If these plants can do the same I'll do okay. Not great, but better than last season. Yesterday I gave the plants a fair amount of nitrogen. With the soils being warm from hot days the biological activity has been high for weeks now. That means nitrogen is available, but may start running low. So I gave the plants some granular 6-2-0 and 24-0-0 on all plants. Today I did a foliar application of TKO as well. Three days ago I gave the plants a little potassium and this morning I gave the plants some TKO. TKO is basically a unique phosphite/potassium fertilizer that can easily be taken up by the plant. Most of this application was on the soil. Over the next two weeks potassium and phosphorous usage of the plants will be higher. Especially the 1974 pumpkin since it will be 28 days old on Monday so it is just now coming into the peak growing phase. 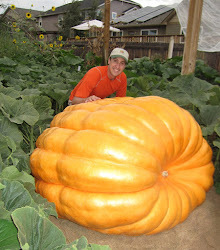 A good pumpkin will put on 40-50 pounds a day from about 26-40 days old if you have a good one. Early signs don't look like this one is going to crank, but even at 25 pounds a day (which is what I peaked around last year) there is a lot of potassium uptake from the soil and the available potassium in the rhizosphere around the root hair can deplete in just 4 days. So this TKO application should help make sure the plant has what it needs to grow a giant pumpkin.